At Budget Blinds of Mid and Outer Cape Cod, we're your local neighborhood experts that truly understand your needs. We're in your neighborhood, we know the local Mid and Outer Cape Cod weather and community, and we’re backed by the #1 provider of blinds, shades, and drapes in North America. Over 25 years of customer satisfaction gives you peace of mind that only comes with choosing the proven leader. We bring the showroom to you in Mid and Outer Cape Cod. We expertly measure your space, install beautiful window treatments, and back it up with the best warranty in the business so you can sit back and relax in the beautiful, Mid and Outer Cape Cod weather and sunshine. We serve to give you the best in window treatments, so you can rest easy knowing your space will be beautified and optimized with window treatments that fit your individual needs. From Barnstable to Provincetown, we are privileged to professionally serve our neighbors with these customer centric core values: honesty, integrity, excellence, and reliability. From Seagull Beach to Pleasant Bay, Nauset Light to Provincetown Monument, if you’ve been thinking of upgrading your home with enduring custom window fashions, then Budget Blinds serving Mid and Outer Cape Cod is here for you. 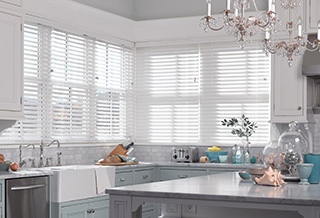 Whether it’s the artisan craftsmanship of wooden shutters, the value and versatility of blinds, the light diffusing and energy saving properties of shades, or our elegant drapery, our locally-based team has you covered. To ensure you have the absolute best in personalized service, our highly trained design staff will provide a complimentary in home consultation and bring our entire showroom to you. Attention to detail, precise measuring, expert knowledge on the latest materials, fabrics, and colors make Budget Blinds your obvious choice for custom window fashions of incomparable value. Budget Blinds serving Mid and Outer Cape Cod is privileged to service our our local neighbors and support local causes. We put our heart and soul into our community as sponsors and volunteers for PAAM (Provincetown Art Association & Museum), SKIP (Soup Kitchen in Provincetown), HOW (Helping our Women), Swim for Life, Provincetown Theater, Working Wardrobes, Homes for Our Troops and the Spina Bifida Association. We put our heart and soul into our community! In the spirit of "giving back", we are proud to support the local arts, national and local community organizations as sponsors and volunteers for PAAM (Provincetown Art Association & Museum), SKIP (Soup Kitchen in Provincetown), HOW (Helping our Women), Swim for Life, Provincetown Theater, Working Wardrobes, Home for Our Troops and the Spina Bifida Association. My experience with budget blinds was excellent. Polite, professional, timely, and knowledgeable about the products. Very helpful showing the different options for each room and best colors suited for each room. The installer did an excellent job as well. I love my new window treatments! Ron was great at making recommendations that would work for each window. The orders went in quickly and with 3 weeks they installed in less than an hour ...would definitely use Budget Blinds again! I couldn’t have had better service. The blinds are absolutely beautiful! The new blinds transformed two rooms.